From the kitchen of One Perfect Bite...When a chef whose specialty is Southwestern cooking, adds Asian spices to pâte à choux, the end result is a churro with attitude. In its simplest form, a churro is a cylindrical piece of fried dough. It was developed by Spanish shepherds centuries ago and it got its name because it resembled the horns of the Churro sheep they tended. The original churro was the size of a breadstick and was usually eaten for breakfast. The churro escaped its borders during the Age of Discovery and can now be found on tables in many parts of the world. Chef David Walzog added ground star anise and lemon zest to the churros he made during his tenure in the kitchen at Arizona 206. They are delicious and easy to make, but they are not with out pitfalls. The churro must be well-drained, but still warm when it receives its sugar coating, and it must be served immediately after that's been done. These wait for no man or woman. You've been warned. You'll see what happens when I don't follow my own advice at the bottom this post. Having shared that with you, I'd like it to remain our little secret. If you have never had a churro, I hope you will give this recipe a try. If you've had them before, I hope you'll give this version a try. The star anise and lemon zest make these really special. Here's the recipe. 2) Combine water, butter, anise and lemon zest in a 3-quart saucepan. Bring to a boil over high heat. Add flour, all at once, and cook, beating constantly until flour forms a ball and films bottom of pan. Remove pan from heat. 3) Beat in eggs, one at a time, until incorporated and mixture is smooth and shiny. 4) Combine granulated sugar and confectioners' sugar in a plastic bag and set aside. 5) Spoon batter into a pastry bag fitted with a medium-sized star tip. 6) Heat 3-inch of oil in a deep pan until it reaches 375 degrees F.
7) Pipe batter into oil in 5 to 6-inch lengths. Do not crowd pan. Fry until golden brown, about three minutes. Remove from oil and drain on paper toweling. Continue frying until all batter has been used. What a unique flavor combo for a churro. This is such a fun treat. I can almost taste the anise! I am sure these churros taste very good and smell wonderful! I love the smell of anise. Oooo this sounds so good! I just bought a churro maker at my local Spanish market. This is a good reason to try it out this weekend. mmmmm those look very tasty!!! These would be trouble for me! Something about sweet fried dough turns me into a glutton! These sound so good Mary. I love anise, it has such a special flavor. I've never had Churros! Need to bake a batch! 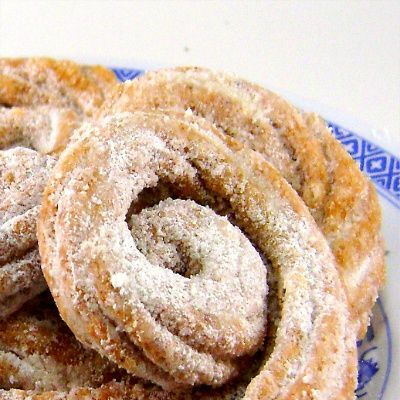 I love churros with thick hot chocolate, this with star anise sounds amazing! Feel like grabbing, very tempting churros..
la foto è talmente bella che mi mangerei lo schermo del computer!!!bravissima!!! I never make churros before, look at your beautiful churros, i feel I want to try it soon. Have a nice weekend ahead. I've not heard of churros before either. They look like they would disappear quickly once served though! We make similar treats like these around the festive Christmas periods. I do find that adding the anis would give our recipe a nice twist. I will have to suggest it to out family. Oh wow!! I've never even thought of making churros. Yours are just stunning! I would have never thought of this combination. It sounds delicious and I'll try it as soon as I can gather an appreciative "audience". Your "secret" is safe with me! 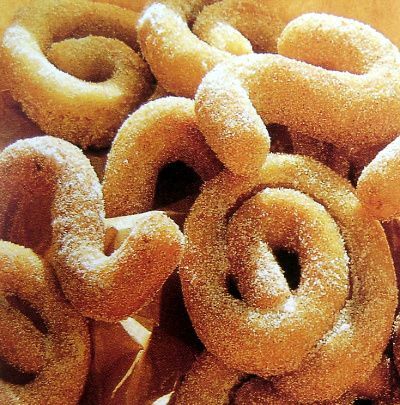 These would be so addictive Mary rolled in sugar and/or cinnamon. I think the lemon and star anise would flavor many things well! Cookies perhaps! For deep fried dough, they do look good, however. Yum! Fried dough is always good! there are some great flavors going on in your churros! there is something so wonderful about frying dough and coating it in sugar!!! Yum, these churros look fantastic. Fried dough with sugar on it - what's not to love? What a great flavor for churros. I've only had them plain. I never would have thought of flavoring these with anise but what a great idea. These are cute and they look delicious!! I've never made them but it sounds intriguing! Yum - my kids adore churros. Two great flavors Mary. I think you created another winner. When my husband is able to eat solid food again I will have to make these as he loves lemon! When I lived in California, you could find Mexican street vendors selling churros. They were so good, but not fancy flavors like these. I've never even thought to try and make them, but now that you've reminded me just how good they are, I'll have to give it a try. Thanks! I've never made churros's before, but I must admit I'm tempted by yours. These look beautiful! Thank you for the history lesson, so interesting. WOnderful recipe.. they are so light and sweet... I have always like them but with star anise... whoa, that's a great idea! Mary, these are beautiful! I love the flavor combinations--definitely a change from the classic churro! I've had plenty of churros before, but have never made them! They look good, and I must try it! Oh, Mary, these look completely irresistible! I have never made churros, as I don't really enjoy deep-frying, but I would make an exception for these! Well done! Yum, yum, yum. I sure wish I had a few of these to eat with my coffee. Churro with an attitude - I like it! I love churros but try to restrain myself from them as much as possible. This gourmet version with the lemon anise flavors is one that I certainly would not be able to resist! A divine combination. Thank you for such inspiration! Yummy, I love love love Churro's. The addition of Anise must make these over the top! These are so cool!! I loved learning how they got their name! I love that you always give information about the background, etc. Makes food much more interesting...and this looks and sounds delicious! Happy Weekend! Yum, yum, yum. These churros look awesome.In Colombia we eat them with hot chocolate. Love the combo Lemon-Anise. Asian Spanish zeppoles!You amaze me, Mary. CHURROS! Yeah, I've been plannng for this too. Hopefully, will be able to try this out soon. Looks so tempting! Hi Mary, this recipe is great! I love churros, but the long ones are usually too much and after half of it I'm sick of the flavor. These bite sized churros are the perfect treat and I love the flavoring. Love churros, but I must say, I prefer to eat them when prepared by someone other than myself! All this frying and serving right away does require a bit of speed and finesse! OH! You read my mind, didn't you? I've been longing to make churros, but since my cookbooks tend to be overwhelmingly French, I was stumped. Thank you, thank you for a terrific recipe! Now these look really interesting. I love the star anise and lemon zest flavor combination for a churro.